Sony release a new flagship device every six months, not only does this annoy customers who bought the previous model but it also keeps Sony current in the face of the marketing juggernaut that is Samsung. As it’s been a few months since the Xperia Z2 was released it’s only natural that leaks about the newer models start to appear. 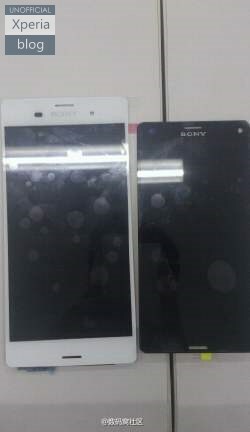 First of all a picture showing what looks like the Xperia Z3 and Z3 Compact side by side. These leaked Xperias have slightly redesigned front facing speakers which if you ask me don’t look as nice as the ones on the Z2. Sony sure do like a big bezel at the top and bottom of the screen. But apparently to cram in all that tech and make it waterproof takes a lot of space hence. But what has always confused me is that they cram the same tech into a smaller chassis and make that waterproof too! Surely they could make the larger Xperia have slightly smaller bezels. The second piece of information has come from Twitter where user @DooMLoRD_XDA has posted details and a screenshot from the Xperia Z3 Compact. 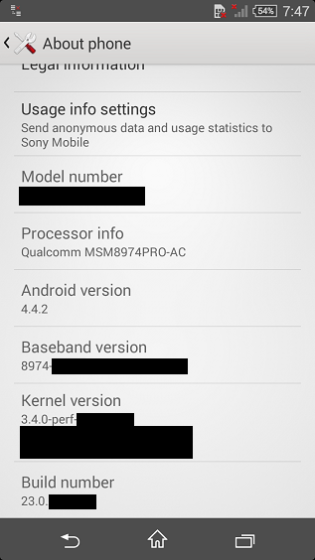 Which shows that the Xperia Z3 Compact is currently running Android 4.4.2 which will no doubt change before it’s released. @DooMLoRD_XDA also posted details of the rumoured specs. They aren’t entirely unexpected. – 2.5 GHz Quad Core Processor (Snapdragon 801 MSM8974-AC chipset). No doubt over the next few months we’ll start to see more details and then launch event details and then the phones themselves. For me personally I’m most interested in the Xperia Z3 Compact as the idea of a smaller flagship device is quite appealing.